View More In Table Runners - Page 10. 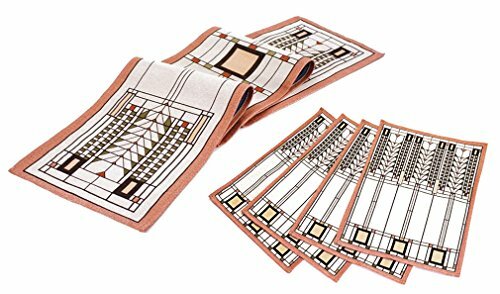 The Frank Lloyd Wright Tree of Life Tapestry Table Runner & 4 Placemats Set is adapted from an art glass window in the Darwin Martin House, Buffalo, New York (1903). Table Runner Dimensions: 75" x 13". Placemats (4) Dimensions: 17" x 13". Cotton/polyester/acrylic blend fabric. Dry clean for best results. If you have any questions about this product by Rennie & Rose, contact us by completing and submitting the form below. If you are looking for a specif part number, please include it with your message. Gitika Goyal Home Crayons on a Table Runner, 74"
Home Collection by Raghu Lover's Knot Jacquard Black and Mustard Table Runner, 14 by 36"